In the fall of 2016, renowned cycling components designer Craig Edwards joined forces with Cane Creek, forming a lasting partnership to not only manufacture and distribute his game-changing eeBrake but also to work hand-in-hand with Cane Creek designers and engineers to develop new products that pushed the sport of cycling into new frontiers. From that partnership, Cane Creek’s ee line was born. What Makes a Product ee? In order to earn the right to be called ee, a product must meet the highest standards of function and innovation. This begins with a rigorous product development process designed to take great ideas and turn them into excellent products. This unique approach and uncompromising commitment to meticulous execution results in products that have surpassed previous industry bests and whose beauty is truly in their function. We use this process to guide us internally and hold ourselves to this high standard so that we know we have achieved a product of the highest quality and performance that can be deemed the best. We believe in innovation rather than following established standards. An ee product is born from questioning the norm and using a new lens to discover connections between different but related facts. When joined together, these facts can create a clear view of something novel, which has never been seen, developed or commercialized before. Something that is truly revolutionary. How do you improve on an age-old design? Ignore it completely. The starfangled nut has been around since the origin of the threadless headset and is, still to this day, at the heart of threadless headset preload design. So when Craig Edwards set out to create a lighter weight preload assembly designed for carbon steertubes he could have easily been bound by that classic design. Instead, however, he broke free from convention and developed a recessed cone shape that created increased tension and stiffness facilitating precise headset adjustment setting it apart from both the original star nut design and other lightweight caps. Engineering is the practical application of art and science. Lessons learned from earlier experiences become the foundational underpinnings of further advances. This process is repeated until the assurance has been gained that all aspects of the product requirements have taken it beyond the state of the art. 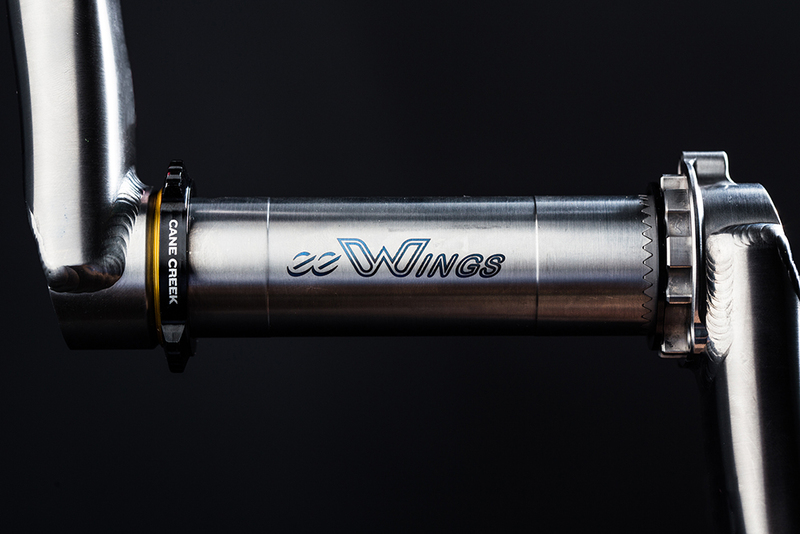 While designing eeWings, we knew we wanted to design a crank that is both extremely durable and ultra-stiff while remaining in a weight class that’s comparable to leading carbon cranks. The solution? A design that relied on both relentless engineering and the choice to use titanium, a superior yet expensive and difficult to work material. Throughout the development process, this focus on relentless engineering and testing resulted in some truly superior features including a 30-tooth hearth joint joining the crank together, hollow tube arms for a superior stiffness-to-weight ratio and a CNC machined aluminum preload with a titanium bolt for a more precise and durable setup. The design process draws upon intuition, imagination and systemic reasoning to explore the many possibilities of what can be created. Maintaining a strict adherence to logic-based decisions creates boundaries for product development ensuring that it is the best it can be for the right reasons. There must be something better than the standard “set screw” design. Why not make a tool-less pad holder? Can a no back out feature be achieved without a tool? Pads can bend. How can the design take advantage of a pad’s inherent flexibility? Design idea: permanantly place the “no back out” feature on the pad holder and design a way to bend the pad around the “no back out” feature during installation. Performance and purpose are prioritized over preconceived notions of what a product should look like. The function of the product must be so extraordinary that the resulting form that it takes defines the appreciation of its appearance. An ee product is unequalled on multiple levels. It bears uncompromised quality and is the very best that can be offered in that category. An ee product cannot be taken at face value, it exhibits the most unlikely idea and contradicts conventional wisdom. When a person first looks at the eeBrake, the appearance suggests one of stiffness and power, yet also of weight. The awe a person exhibits when they pick it up or see the actual reading on a scale suggest that their intuition had told them something different.